One side of me would prefer to call this my visual 'journal,' as this section reflects images that I make, new techniques I try, places I explore or events that I record throughout the year . Frequently I will pair a quote with an image which often enhances or adds depth and new meaning to an image. Thank you for your visits and comments. Both are important! Yes, this daisy is the same as the previous post....but with a "twist!" Learning post processing techniques is a continual challenge for me; but a challenge I am embracing. 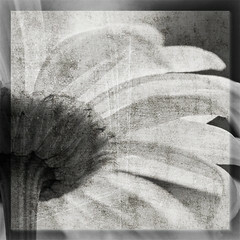 The original daisy image was converted to black and white and enhanced using two texture layers. The inspiration came from "bebe nurse" (http://flickr.com/people/bebenurse/) I had enjoyed her beautiful treatment of still life images and challenged myself to accomplish a similiar look. are flowers that never fade. Taken in my back yard, I was trying to present a different perspective of the common daisy. 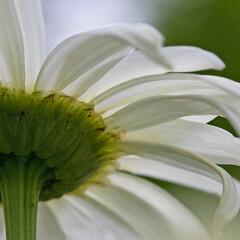 The graceful petals of the daisy are what captivate and hold my attention, as do the calm, subtle colors. Using a macro lens allowed me to get in close. The only crop was that of making a square image rather than the standard proportions. Welcome to Sue Henry Photography; a blog spot which will allow me to share some of my favorite photographic images as well the adventures that take place during the creation of those images. The goal is to update this blog weekly; selecting and highlighting at least one of my favorite images each week. Stay tuned. Hold on to your seats. The adventure is about to begin!